In this article we will go through how you can but cloud mining with PayPal. Currently, there are no cloud mining providers that accept PayPal as direct payment method. 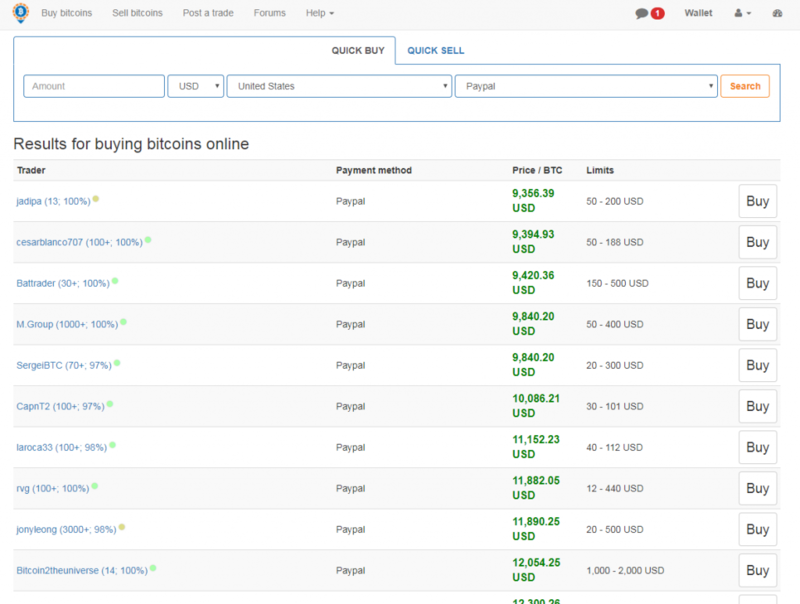 However, there are several peer-to-peer marketplaces where people accept PayPal for their Bitcoin. We present LocalBitcoins, VirWox and Paxful. The article reviews their verification requirements, fees, regional availability. We also compare the PayPal with other payment options, such as bank wire transfers and credit cards. 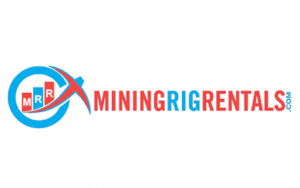 If you already have Bitcoins and want a cloud mining contract we recommend you to read legit cloud mining companies in 2019. Unlike with credit cards and wire transfers, it is quite difficult to get contracts from cloud mining providers sing PayPal. Even regular exchanges do not offer the method as often as other two options. The reason for such development lies in the fact that PayPal does not allow transactions that involve the exchange of currencies. Since bitcoin and other cryptos are viewed as one, the platform would ban the accounts dung the transfer. PayPal also charges relatively high fees of 2.9% + $0.3 for each transaction, making it quite expensive. Compared to credit cards (up to 1.9%) and bank transfers (1%), PayPal is the most costly option. That is why many platforms, cloud mining companies included, bypass the method, even though it is quite popular. So, if there are no cloud mining providers accepting PayPal as a payment method, what should investors do? You can buy contracts indirectly, by purchasing bitcoins first using PayPal and then use them to get contracts. We go over several of the most popular options in the industry, them being LocalBitcoins, VirWox, and Paxful. LocalBitcoins is a peer-to-peer (P2P) platform that allows users to buy and sell bitcoins between each other. Acting as a single marketplace, you can work with bitcoins only in this website as other altcoins can be used only a medium for BTC payment. If you are looking for a way to get Ethereum for cloud contracts, then LocalBitcoins should not be your choice. Bitcoin traders have 1% fee for escrow services, which we recommend wholeheartedly due to numerous scams reported in the past. Verification depends on your personal preferences, while the speed of transactions relies on seller’s adherence to trade agreement. The service is available globally, with anyone able to set buy and sell ads, as seen in the snapshot below. PayPal is a popular option to receive funds in several countries, USA especially. 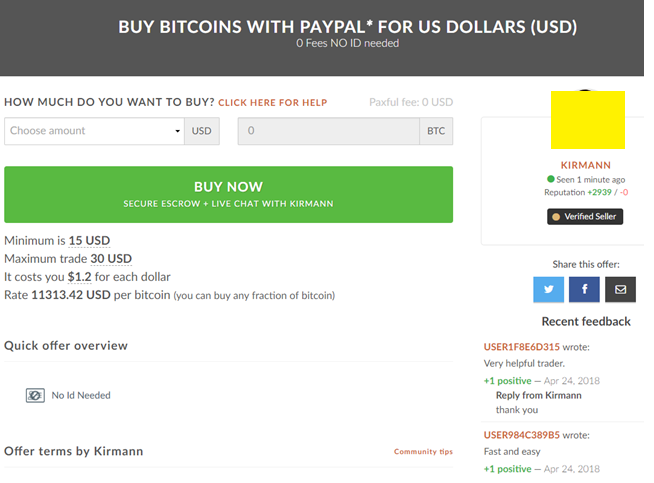 Thus, there is no lack of supply when it comes to PayPal option at LocalBitcoins. Apart from P2P marketplaces, you can also purchase coins with the help of PayPal in VirWox. The platform offers a private environment for transactions to take place since o verification demands are made. You can log in and trade using your password and username only, without the need to provide personal details. However, VirWox has two distinct disadvantages when compared to rivals in the market. Firstly, it is not predominantly a place to get BTCs. They work Second Life Lindens (SLLs) for a virtual world called Second Life. You have to buy them first and then swap them with bitcoins. This roundabout method carries three transactions, with each carrying a fee of 3.5%. Add to that PayPal expenses as well and you have a total of 14% of costs at the end of the day. The second issue is the lack of available cryptocurrencies, as you can get only bitcoins at VirWox. You might exchange SLLs but these are not available for cloud mining. Paxful is a crypto exchange platform that has many similarities with LocalBitcoins. 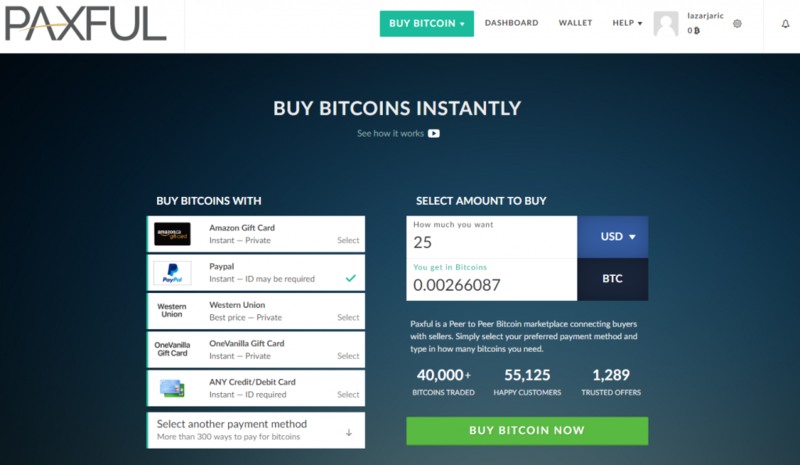 The platform offers bitcoins only through many payment methods, PayPal included. Traders from around the globe buy and sell cryptos from each other, bypassing middleman in the process. The fee structure is similar to LocalBitcoins with the only difference being that 1% is paid by sellers only. Verification demands are left to buyers and sellers to agree on thought the platform itself does not offer identity checks. For each trade, you might be required to provide a scanned copy of your ID. You can check these requirements by sifting through different ads, as seen below. Usually, a small amount of coins is available on individual ads while differences in price can vary greatly. PayPal is a popular option but also more costly than bank transfers for example. At this very moment, there are no cloud mining providers that offer PayPal as a method of program purchase. Well, those that are reliable anyway, as we would recommend only those platforms that have proven history. Genesis Mining, Hashflare, and hashing24 all do not offer PayPal due to the large fees and lack of support by the payment system for cryptocurrencies. You need to undergo indirectly while using the PayPal, meaning more costs on your end. Credit cards and bank transfers are more present in the industry. 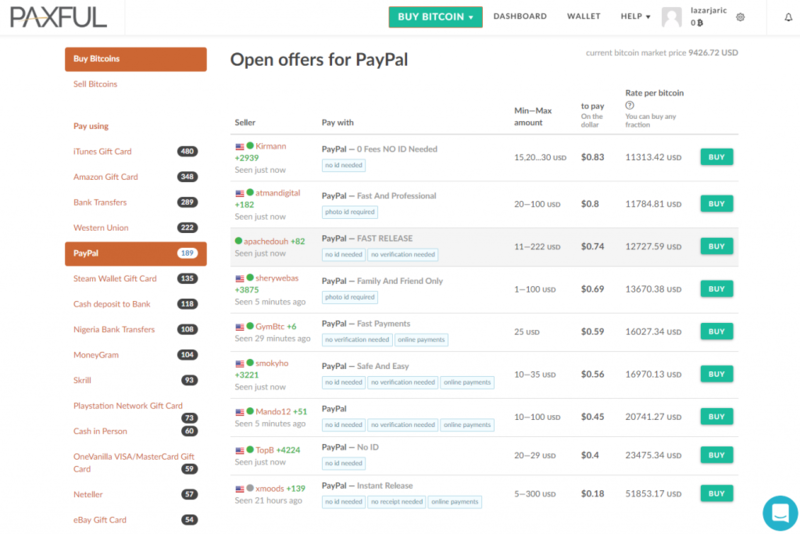 In this guide, we provide you with step-by-step guide on how to purchase bitcoins using PayPal at Paxful platform. Registering an account at this website is usual business – it takes less than 5 minutes with only email needed for verification. Then, login and select PayPal as a payment method as shown in picture below. Specify the amount and price of bitcoins you wish to purchase. Once done, click “Buy bitcoin now” to start the process. You will get a list of available offers in the market, with best deals listed at the top of the page. Select the ad that suits your needs in terms of BTC price and available volume for purchase. In the case of PayPal, seller would then simply provide you with their PayPal account’s ID on which you should send money. Once done, make screenshot of the payment confirmation as a proof of purchase. Seller would then release bitcoins through escrow service provide by Paxful. Overall, in this cloud mining PayPal review, we touched upon fees and platforms that accept the method of payment. We deem PayPal as the least favorable when compared to credit cards and bank transfers. Many sites that have been proven as scams use the method. 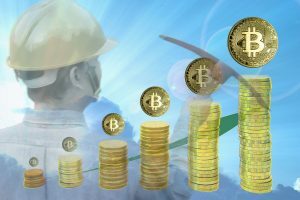 Legit cloud mining platforms, on the other hand, avoid it due to its high fee structure.